And were not left outside the bridal chamber of the Lord. In the town of Nisibis, on the border with the Persian Empire yet under Roman control, there was a convent of women containing fifty nuns under the direction of the deaconess Bryene. 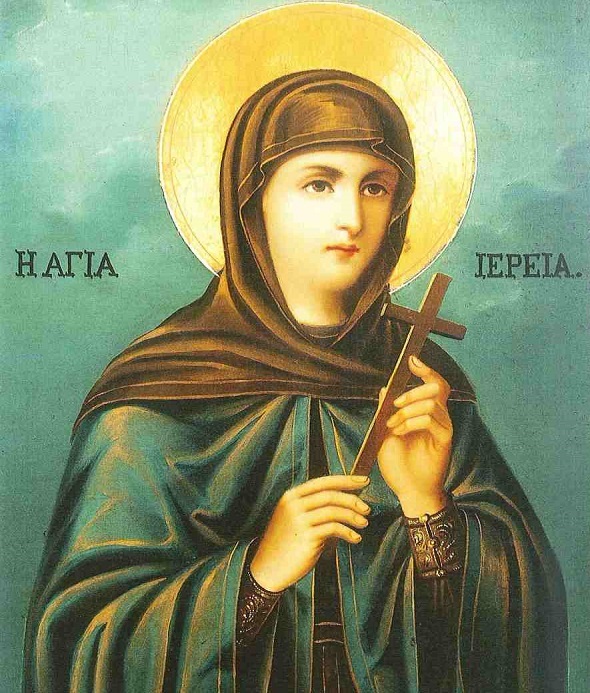 One woman brought up by her and well instructed in the monastic life was Febronia (June 25). Febronia was the daughter of Bryene’s brother, and she was of extremely attractive appearance: her face and features were so beautiful that the eye could never be sated by gazing upon her. For this reason Bryene was twice as strict with her, wanting to protect her from outside temptations. She only ate once every other day, she slept while sitting on a stool, and she spent much time studying Holy Scripture. On Fridays, when all the sisters were gathered in the place of prayer, Bryene used to tell Febronia to read the divine words to them. Because, however, young married women used to come to the place of prayer on Sundays and Fridays to hear the word of God, Bryene instructed Febronia to sit behind a curtain and read from there. She never saw any worldly finery and did not know what a man’s face looked like. But she was the subject of much talk throughout the entire town - people spoke of her learning, beauty, humility, and gentleness. When Hieria, who had been married to a senator, heard all this, she was fired by divine love and became very eager to see Febronia. Now Hieria had not yet come to baptism, but she was still a pagan, and when she had only lived seven months with her husband, he died, leaving her a widow; for this reason she returned to her own town to her par­ents, who were also still pagans. When Bryene introduced Hieria under this guise to Febronia, the latter, on seeing the monastic habit, fell down before her feet, supposing that she was a nun from somewhere else who had come to her. After they had greeted one another and sat down, Bryene told Febronia to take the Bible and read to Hieria. As Febronia read, Hieria’s soul was so filled with sorrow and com­punction as a result of the sight of Febronia and of the teaching that she heard that the two of them spent the whole night with­out any sleep: Febronia did not cease or tire from reading, and Hieria never had enough as she listened to her teaching, in tears while she groaned and sighed. When morning came, Bryene could scarcely persuade Hieria to come down and return to her parents’ home. When they had bidden farewell to one another, Hieria departed, her eyes brim­ming with tears. She went home and urged her parents to abandon the empty tradition of idolatry that they had received from their own par­ents, and instead recognize God, the Creator of all. “Don’t you know who this sister is?” replied Thomais. “How could I recognize her, seeing that she is a stranger?” said Febronia. “These were the instructions of the abbess,” replied Thomais. Now it so happened that at that time Febronia fell gravely ill and lay on her pallet at the point of death. When Hieria heard the news, she came along and did not leave Febronia’s side until she had recovered from her illness. At that time Emperor Diocletian sent a detachment of soldiers to Assyria under the command of Lysimachus, Selenos and Primus with orders to destroy the Christian community. When the detachment of soldiers approached the convent, the inhabitants hid. Only Abbess Bryene, her helper Thomais and Febronia remained. Eventually Selenos had Febronia fiercely tortured for refusing to deny her faith in Christ. She suffered unspeakable torments at his command. When Hieria, the senator’s wife, learnt that the nun Febronia was to be tried before the judge’s tribunal, she got up and gave a loud wail. Her parents and everyone in the house asked her in amazement what was the matter. “My sister Febronia has gone to the court house,” she replied. “My teacher is on trial for being a Christian.” Her parents tried hard to get her to calm down, but she lamented and wept all the more. “Leave me alone to weep bitterly for my sister and teacher Febronia,” she begged them. Her words so affected her parents that they started mourning for Febronia. Having asked them to allow her to go and see the con­test, she set off with a number of servants and handmaids. As she came running in tears to the spectacle, she met on the road throngs of women also running and lamenting. She also came across Thomais, and having recognized one another, they came together, lamenting and weeping, to the site of the spectacle. When Febronia heard Hieria’s voice as she lay on the ground, she asked the soldiers to bring some water for her face. They brought it at once and applied it to her face. This at once revived her and she asked to see Hieria. The judge, however, told her to stand up and answer his questions. Then he put Febronia through even more severe tortures. The judge was enraged by Hieria’s words and gave orders that she too be brought down to be tried. 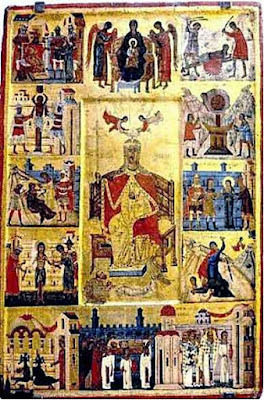 On hearing this, Hieria hurriedly came down, full of happiness, saying, “O God of Febronia, receive me too, a poor pagan, along with my lady Febronia." As she was making her way down, Selenos’ friends advised him not to bring her down in public, otherwise the entire city would join her in martyrdom and the city would be lost. Selenos accepted the advice, and so did not make Hieria stand there in public; instead, flaring up in a rage, he simply addressed her: “Listen, Hieria, as the gods live, you have become the cause of many further sufferings for Febronia.” Whereupon he ordered both Febronia’s hands and her right foot to be cut off. The execu­tioner immediately brought along a block, placed it under her right hand and struck it off with a single blow of the axe. He did the same with her left hand. Then the executioner placed the block under her right foot and brought down the axe, but failed to sever the foot; he struck a second time but failed again. The crowd in the meantime uttered gasps and groans. When he struck her the third time with the axe, he only just managed to sever Febronia’s foot. The blessed woman’s body was quivering all over, and she was on the point of expiring; nevertheless, she tried to put her other leg on the wooden block, asking for it to be cut off as well. When the judge saw what she was doing, he ex­claimed, “Just look at the perseverance of the impudent woman,” and in a great fury he said to the executioner, “Go on, cut it off.” Finally, after spending some time in anguish, Saint Febronia was beheaded. Large crowds of pagans came to believe in our Lord and were baptized. Lysimachus and Primus themselves were bap­tized, and renouncing the world, they went off with the abbot Markellinos to live a life pleasing to Christ, completing their days in peace. Many of the soldiers believed in our Lord and were baptized, as were Hieria and her parents. Hieria left her parents, renounced the world, and went off to the convent, which she en­dowed with all that she possessed. She requested Bryene, asking her, “I beg you, mother, let your handmaid take the place of the lady Febronia: I will toil as she did.” So Hieria threw off all her jewelry, and she had the blessed girl’s coffin covered with gold and pearls all over. When the bishops had finished praying and everyone had said” Amen” after them, they approached to take up the blessed girl’s coffin. At that moment there was a clap of thunder in the sky, and all the people fell down in fright. Then after a while they put out their hands to take the coffin, but this time there was a great earthquake, so that they imagined the entire town would be ruined. So they did. And Hieria lived in the convent the rest of her life, and she reposed in peace. The energies of the Divine Spirit, you received as a living fire, Hieria by your luminous conduct, you bring fervor to our inellects, and eradicate our bonds to evil; glorious Mother, entreat Christ God, to grant us the great mercy. The abundant rain of your pains O Venerable one, quenches the burning of the passions, and thoroughly waters our intellects, towards true fruitfulness; therefore Hieria we celebrate you. You entered the angelic life, and were made worthy of otherworldly gleaming, Mother Hieria, having beheld glory, through you may we be kept invulnerable.